Joboshare DVD to 3GP Bundle is a easy-to-use 3GP bundle including Joboshare DVD to 3GP Converter and Joboshare 3GP Video Converter. It can rip DVD and convert VOB, AVI, DivX, XviD, WMV, MPEG, MPG, DAT (VCD), RM, RMVB, MOV, ASF to 3GP video formats 3GP, 3GPP2, MPEG1/2/4, WAV, Xvid, RM with fastest speed. It also supports extract audio track from videos to MP3, WAV, RA, AAC, M4A. ...... Joboshare DVD to 3GP Converter can rip DVD and convert DVD to 3GP video formats like 3GP, 3GPP2, 3G2, MPEG1/2, MPEG-4, WAV, Xvid, RM and extract DVD audio to 3GP audio formats like MP3, WAV, RA, AAC, M4A, etc. And Joboshare 3GP Video Converter can convert video formats including AVI, MPEG, 3GP, WMV, MPEG, MOV, RM, and so on to playback on all different brands of cell phones such as Nokia, Motorola, Sony Ericsson etc. It supports all different brands of cell phones such as Nokia, Motorola, Sony Ericsson and so on. 2. 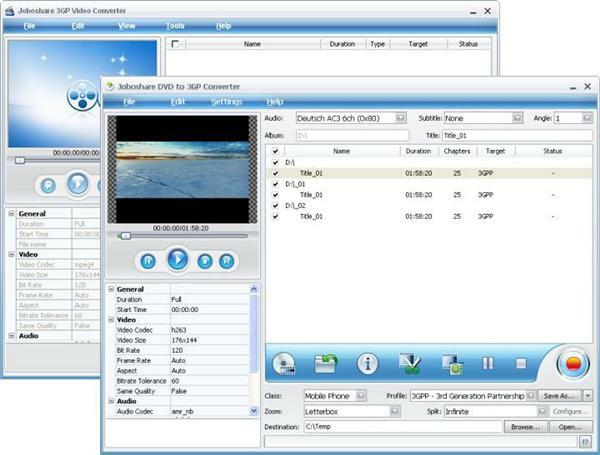 Joboshare DVD to 3GP Bundle = Joboshare DVD to 3GP Converter + Joboshare 3GP Video Converter. 3. Support converting DVD and video files to all mobile phone video formats including 3GP, 3G2 (3GPP2), MPEG-4, WMV, WMA, MOV and H.264/MPEG-4 AVC. 4. Support converting audio-only 3GP file or extracting DVD audio to MP3, WAV, RA, AAC, M4A for playback on cell phones. Convert DVD to 3GP, Rip DVD to 3GP. Qweas is providing links to Joboshare DVD to 3GP Bundle 2.7.9.0214 as a courtesy, and makes no representations regarding Joboshare DVD to 3GP Bundle or any other applications or any information related thereto. Any questions, complaints or claims regarding this application Joboshare DVD to 3GP Bundle 2.7.9.0214 must be directed to the appropriate software vendor. You may click the publisher link of Joboshare DVD to 3GP Bundle on the top of this page to get more details about the vendor.